This leaflet has been produced to give you general information about performing a pregnancy test. Most of your questions should be answered by this leaflet. It is not intended to replace the discussion between you and your doctor but may act as a starting point for discussion. If after reading it you have any concerns or require further explanation, please discuss this with a member of the healthcare team who has been caring for you. How do you complete a pregnancy test? Step 1 – Remove test from packet. Step 2 – Remove the cap and place it on the thumb grip end. Step 4 – After at least 10 seconds, remove the test from your urine and immediately replace the thumb grip cap back over the absorbent tip. Step 5 – Lay the test on a flat surface with the Test and Control window facing upwards and then begin timing. Step 6 – As the test begins to work, you may notice a light red flow moving across the Test and Control windows. Wait at least 3 minutes for the red line(s) to appear. If no red line appears, wait one minute longer. Some positive results may be seen in 1 minute or less. Do not read the test result after 10 minutes. How do I read the test results? 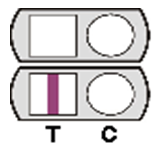 Pregnancy hormone levels present – 2 red lines in both the test window (T) and control window (C) means you may have retained products of conception. One line may be lighter than the other; they do not have to match. No pregnancy hormone level present 1 red line in the control window (C) means that your pregnancy hormone levels are falling and the products of conception has been passed. The result is invalid (the test has not worked) if no red line appears in the control window (C), even if a line appears in the test window (T). You should repeat the test with a new midstream urine test using a new device. If you are well and your test is negative you will be discharged. If the test remains weakly positive (faint line) we will book you in for an assessment. If you have not had any change in symptoms and the test remains strongly positive you will be asked to return to the hospital for assessment and an ultrasound scan. When will my periods return to normal? If your periods were regular before you got pregnant, then your periods should return to normal within 4-6 weeks. This will also depend on what type of contraception you are taking.